Among the surging hills of the eastern Algarve, Monte Rei flows effortlessly over the striking Portuguese landscape, creating a golf course that has captured the hearts of golfers the world over. Since first opening its doors in 2007, Monte Rei has experienced a meteoric rise in popularity, with Jack Nicklaus’ signature design now heralded as one of the greatest layouts in the entire world. Monte Rei Resort is found just three miles from Manta Rota Beach on the Atlantic coast, only a 45-minute drive from Faro Airport, in a peaceful setting that makes a great change of pace from the liveliness of Vilamoura. Accommodation at Monte Rei comes in the form of opulent Portuguese villas, located within a few minutes of the spectacular hilltop clubhouse. The course measures just over 7,200 yards from the championship markers and with a dramatic finishing hole in the 550 yard par-5 18th there is sure to be some excitement when Monte Rei hosts a professional tournament in future years. Although the course can satisfy the longest hitters it is around the greens where shots will be dropped, the subtle undulations on the putting surfaces as well as numerous runoff areas ensure that only the best struck shot will find the right part of the putting surface. With this breathtaking golf course complimented perfectly by stunning views Monte Rei is a golf course that is etched on your golfing soul. 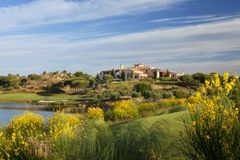 Monte Rei Golf Resort is one of the finest holiday destinations to emerge in recent years. With an emphasis on service and five-star luxury, those fortunate to visit this luxury resort will have an experience that they won’t forget. The 18th is an outstanding finishing hole. A long, downhill par 5, with a tempting play to go for the green in two, for those not feeling the weariness of the round’s golf. However, this option should be considered by the long hitters only and golfers should take caution of the lake before the green, ready to catch any mis hit approach shots. Golfers travelling to Monte Rei can enjoy the nearby swimming pool within the resort’s complex as well tennis courts and one of the finest driving ranges in Europe. Guests can practice their long game as well as fine tuning their short game on the dedicated green complete with cavernous bunker and lightning quick putting green. With a host of local beers and wines on offer, the club house at Monte Rei is the perfect place to relax after a round of golf. Those wishing to sample some of the cuisine should try the Monte Rei Club Sandwich which has been ranked by Your Golf Travel staff as the best in Portugal! First class attention to detail from being met right through to the clubs being returned cleaned to our cars. Great course although tough and not suitable for high handicappers it rewarded good play and a solid drive and a long second set up a chance of points with an accurate approach. Expensive indeed but overall worth it. Read the reviews before the trip and the course did not disappoint. Excellent service after getting off our coach and that continued until we left. Some real stand out holes and an excellent challenging course in top condition. If you have the chance a must play on your holiday list. What a golf course, amazing. Tapas lunch included in the green fee not worth it. From the moment we arrived, Monte Rei was beyond our expectations. We were met in the car park and our clubs were put onto our buggies and were made to feel very welcome. The clubhouse is excellent with views across the course and surrounding countryside. The driving range and short game area is really impressive so would recommend having a go on here before heading out onto the course. The layout is great and very playable. Each hole is very separate from each other giving a nice feel of seclusion during the round. There are lots of good holes here but would say the par-5 18th with its grandstand finish of water lining the final part of the hole and protecting the green, despite my second shot finding the water, I left really impressed with the course and will be playing again next time we come to the Algarve.